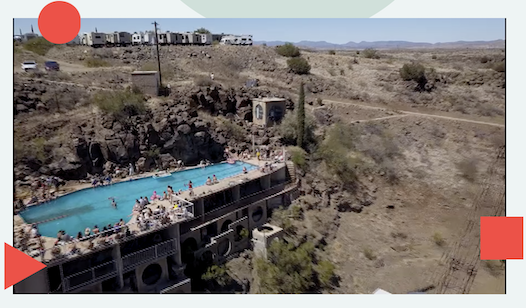 FORM Arcosanti, the annual music festival and creative retreat, has announced that the 2019 edition will take place the weekend of May 10-12, 2019 in the experimental eco-city of Arcosanti, AZ. Surrounded by futuristic architecture and desert landscapes, participants will experience three days and nights of performances, talks and panels, immersive art, workshops, wellness activities, and more. REGISTER HERE for the sixth annual FORM Arcosanti. One of the festival’s founding artists, Trayer Tryon of Hundred Waters, has created a mixtape featuring music from many past FORM performers — listen HERE. A limited number of Early Bird tickets to FORM Arcosanti are available now (Thursday, Nov 8) for $349 and can be secured for $89 down with a monthly payment plan. Passes include a campsite for all 3 nights, though participants can come and go as they please throughout the weekend. New Carefree Camping packages that include tents, sleeping pads/bags and pillows for 1 or 2 people. FORM Arcosanti reimagines what a festival can be. Breathtakingly intimate performances with no overlapping sets. Immersive art and activities. Cliffside pool parties and rooftop yoga. All backdropped by Arcosanti’s otherworldly architecture and landscapes. With only 2,000 participants, no VIP sections and minimal waste, FORM is a uniquely intimate, sustainable, and community-oriented festival. Previous iterations have featured performers like Solange, James Blake, Beach House, Flying Lotus, Fleet Foxes, Father John Misty, Blood Orange, and Skrillex, as well as cultural partners like ACLU, Planned Parenthood, Human Rights Campaign, and Phoenix Art Museum. Full lineup and more details about FORM Arcosanti are due in the coming months. The shows at FORM Arcosanti are awesome. Thanks for sharing the details.